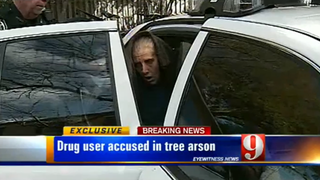 Because Florida is running out of unique ways to embarrass itself, a 26-year old meth enthusiast set fire to and destroyed the world's fifth oldest tree last month. While she was in it. Smoking meth. Sarah Barnes had climbed the tree to smoke, because where better to get high than in the branches of a 118-foot, 3,500 year old cypress ? The fire in question came when she wanted to get a better view of her surroundings, and presumably also her drugs. "The Senator," as the tree was known, was burned to the ground. The good news is that Barnes seemed sufficiently chastened by the whole thing, reportedly telling friends that "I can't believe I burned down a tree older than Jesus." Neither can he, Sarah. Neither can he. So what have we learned? First of all, please be careful with lighters. In the wrong hands, they can be deceptively destructive little gadgets. And then yes, right, meth. Don't do that. Update: Apparently Ms. Barnes was actually inside the trunk of the tree, not on a branch, which is somehow even sadder/worse.